That’s right – I’m back on a cardiac ICU unit! *Before you write to tell me that Ambien is a poor solution for sleep and that it causes all sorts of bad side effects, you must first try sleeping in 3-7 hour increments, completely at random, for eighteen months. The times when you sleep: random. The duration that you sleep: random. The times when you are awake and work: random. Only then may you throw your stones at glass houses. I write this post while on two straight weeks of nights in the cardiac ICU. This ICU is in a different hospital than my home facility (the one with the marauding Chief Privacy Officer). This is because my home hospital’s cardiac unit can charitably be described as a glorified urinal, since the only thing we do there is make otherwise stable people pee. It is not a high-acuity place, which perhaps explains the nurses’ obsession with repleting potassium as they have nothing else to stress out about. As an undertrained ER resident who works mostly at NARH, the main reason we rotate through ICUs at all is to learn management of critically ill, sick patients. Since neither our home cardiac ICU nor NARH provides much of this, we rotate at a different hospital’s ICU, where we do two weeks of days followed by two weeks of nights. This unit is indeed full of sick, critically ill patients. They have things placed inside their hearts called Impellas, which are attached to machines that make scary loud beeping noises I do not understand. The patients often have “balloon pumps,” which I also do not understand. Some of them have “pacemakers in VVI mode,” which I am supposed to understand but do not, despite many earnest cardiologists explaining this. And of course, we make them urinate gallons – diurese, in medical terms. That said, the majority of action in this unit is supposed to happen during the day. Most of my EM friends have described nights in the CICU, as it’s called here, as “chill.” Most of my friends have finished multiple Netflix series while chilling on nights. Most of my friends admitted one, possibly two patients a night. As is my typical ICU luck, I have had none of these experiences. Last night was my most chill night of the whole rotation, during which I admitted only four patients on a night my overworked and exhausted cardiology fellow referred to as a “disaster of a night.” It was the first night of my rotation that my intern did not cry from the overwhelming load of notes. I thought it went great. A typical ICU night for me includes admitting six to eight patients, having multiple Goals of Care Discussions at 3am so we don’t have to do CPR on a 104-year-old with a bad heart, and having multiple heated debates with the charge nurse (who hates me) over where the hell all these patients are supposed to go. Anyway. 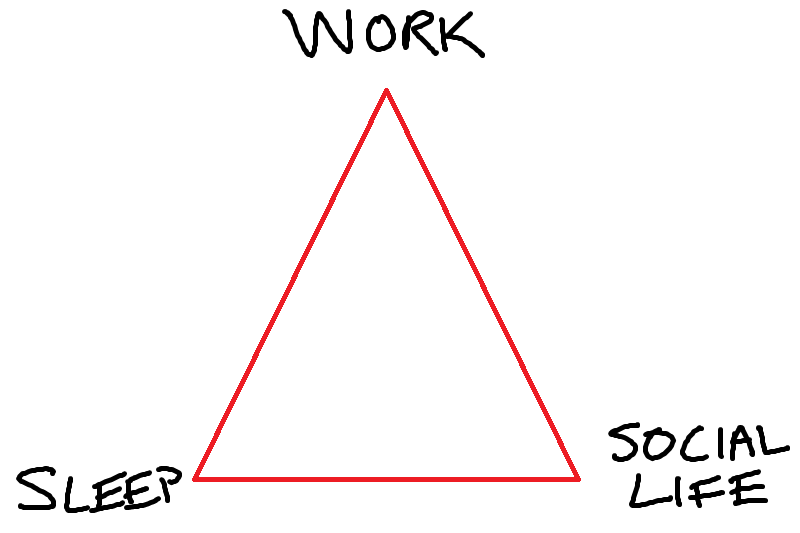 I write today to talk about a triad. 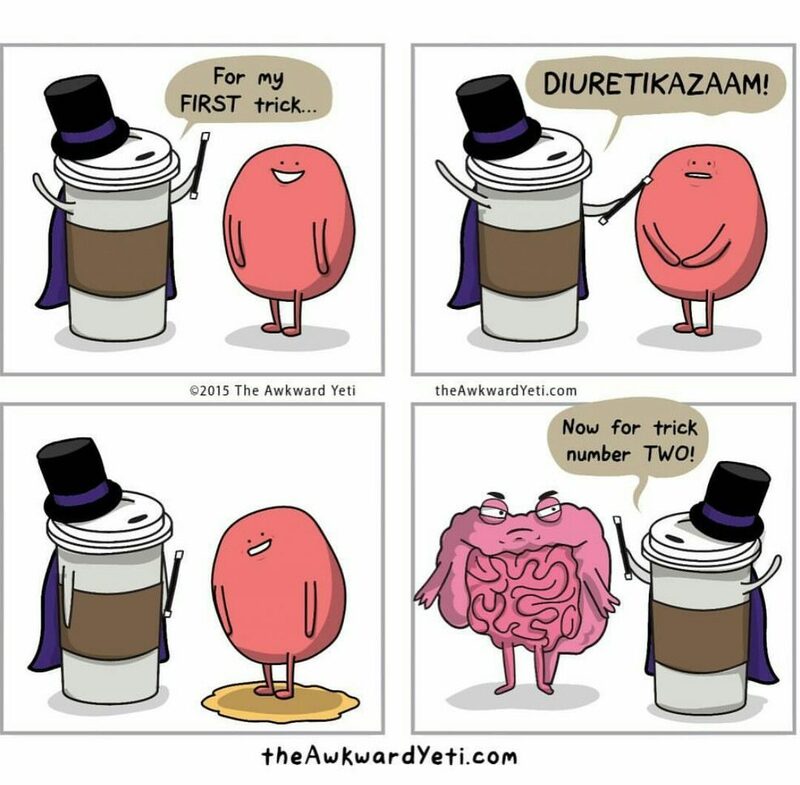 We love triads (and its sisters tetrads and pentads) in medicine. Anything that can be expressed in a triad will most definitely be expressed in a triad. I do not know why, although I suspect that, like most medical things, it is a general attempt by dead white men to get stuff named after themselves. I kept wanting to add Reynold’s Pentad and the TTP Pentad to the list, but obviously those are five-numbered things and do not count. There are also spirals, loops, curves, and other geometric and non-geometric objects upon which medical education fixates, but we will avoid these. For brevity. I made that myself! In Microsoft Paint! This is my current reality. On a long string of nights, my schedule is the following: go to work, come home, go to sleep, go to work. At some point in there, I eat, shower, and drink coffee. But there is no social life. This is why I requested an antidepressant: it is an exceptionally lonely arm of the Triad. Night shifts make this option particularly awful. On this current string, I get two days off a week. On my last day off I had a total of 36 hours off. I slept for 31 of them. This is also not an exaggeration. This arm of the Triad is awesome! You lead a normal life: you sleep 5+ hours a night. You have time to hang out with friends and go to happy hour and get drunk and go to the beach. You can call your grandmother on the phone. You can water your plants and go on unsatisfying app-based dates. Unfortunately, this only happens when you are on vacation, an elective, or… nope, those are the only two options. This option always seems like a great idea until you do it: have work, but then sacrifice sleep in the name of being a normal social human and doing normal social things like spending time with friends and loved ones. It’s great. Until the absolute freight train that is total exhaustion hits you with the force of a sledgehammer. After a few days of Option 3, your body shuts down. You develop eye twitches. You start getting confused about what was real and what was dreamed during your brief three-hour snooze. After awhile, you stop functioning at work and fall asleep at the bar. Option 3 lasts at most a few days before you have to try a different arm of the Triad, which is Option 1 pretty much 100% of the time. This is residency in a nutshell: cycling forever back and forth between no social life or no sleep, with work the only constant. Now if you’ll excuse me, I have to go to sleep again before my 10th night shift in a row. dear nathan, send me the name of the dr incharge of the residents schedule as i plan to call him chances are his residency was not that sleep-deprived. therefore, he has no rachmones(sensitivity ) . be sure to spell his name so i pronounce it correctly tomorrow. I hope the Ambien has the desired effect. For me it kept me wide awake instead of helping me sleep. Not quite what I was aiming for.